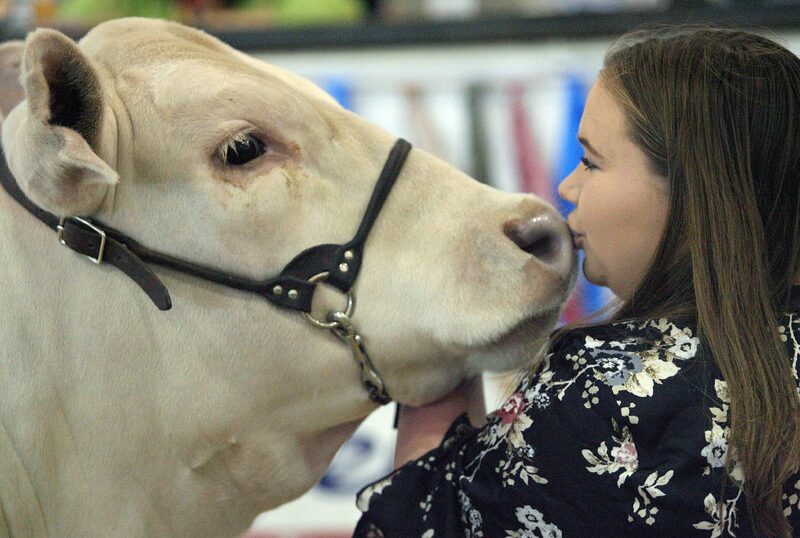 Logan Thomas,16 of Lyford FFA, whispers to her Reserve Grand Champion Steer named "Curly" during the Rio Grande Valley Livestock Show 2018 Sale of Champions Saturday March 16, 2018, in Mercedes. Thomas steer weighed 1389. MERCEDES — Upon being stamped on the hand with a red goat for admission and entering through the main archway of the Mercedes Livestock Show Grounds visitors walked under the Texas state flag that, in turn, waved beneath that of the United States Flag. In the background and all throughout the grounds, country music blares from the speakers as the 79th annual Rio Grande Valley Livestock Show as the final day arrives. Large groups of friends and families walked the grounds, braved the rides, tasted an assortment of foods while keeping their cool with freshly-squeezed lemonade, cold brew coffee and icy drinks. Cowboy hats and caps were a popular choice of fashion during the day to shield from the sun. Thousands of couples, families and carnival ride enthusiasts partook in this year’s multi-week event. 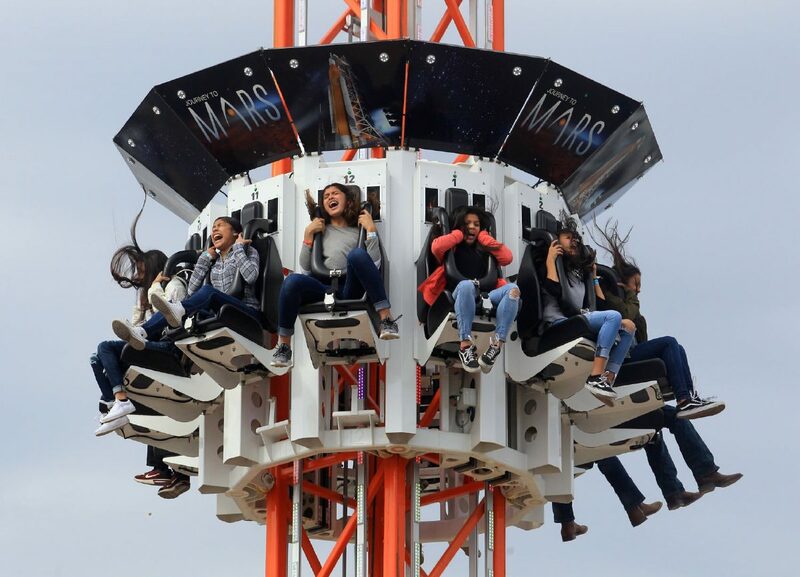 Adventure seekers enjoy the carnival rides as they are dropped from the top of the Journey to Mars ride at the Carnival Midway during the Rio Grande Valley Livestock Show Monday, March 12, 2018, in Mercedes. 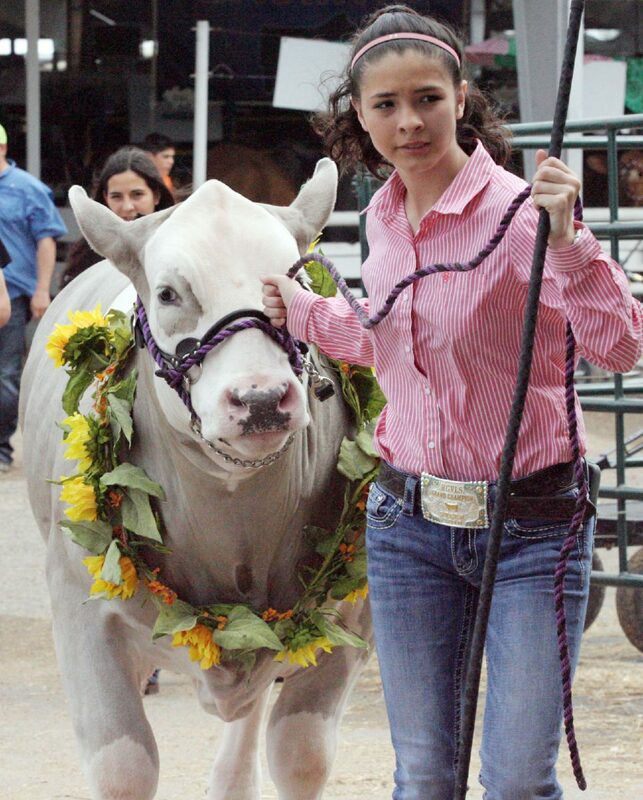 Danielle Rangel of Sharyland Pioneer FFA, leads her Grand Champion Steer named" A.M.C" to the Sale of Champions at the Rio Grande Valley Livestock Show 2018 Saturday March 16, 2018, in Mercedes. Her winning steer weighed 1325 and sold for over $20,000 to a local business. Before the final count could be provided, the estimated total attendance was around 250,000. Magical and musical performances took place throughout the week, FFA members showcased their animals and 10s of thousands of dollars in scholarships were awarded to students. Siblings Gael, Ashley and Kaylee Silva enjoyed watching the pig races Sunday and were excited to have witnessed the birth of kids from a mother goat. Although they were denied entry to several rides due to height requirements, the three zoomed all around and found luck in a baseball-throwing game. Each walked in tow with their prize — an inflatable bat. “He won it for me,” said Kaylee,7, of her big brother Gael, 10. Scattered all about were local pop-up shops in which owners handed out catalogs or demonstrated products. In an exhibit hall, Hannah Gomez, 17, worked a stand alongside friends. She does not recall a year not participating. While “not a ride lover” by any means, she said, interacting with new faces and visiting a neighboring loaded baked potato stand make it worthwhile. When the station isn’t so busy he gets to chat with his coworker and buddy, but at night, he said, the carnival really begins to come alive. On the job, he said, he almost always has an appetite due to the wafting scents of food from a pizza cart a few meters away. Beneath some shade, a crowd gathered to witness “The Magic of Scott Pepper.” In the interactive show, hesitant members were pulled from the benches and bleachers for demonstrations. At the end of it all, they did return from the stage in one piece. According to officials, since its origin the event has steadily grown to feature more entertainment, as well as visitors, and has been recognized as one of the top 10 livestock shows in the state. Yvonne Martinez of Harlingen returned for the second time this year to spend time with her family before the young ones return to school. Born and raised in Mercedes, Martinez has visited the show since she was a little girl. These days she prefers to wait for her children on the sidelines of the ride, but she recalls the “Rock-Itt,” to have been her childhood favorite. “Every year there’s something different to look forward to,” she said.